Hey y'all! How's it going? just a quick reminder that the giveaway I'm hosting is ending tomorrow, so if you want to enter, be sure to hop on over soon! Everyone knows I love socks - I have in the past written a whole post just about socks. 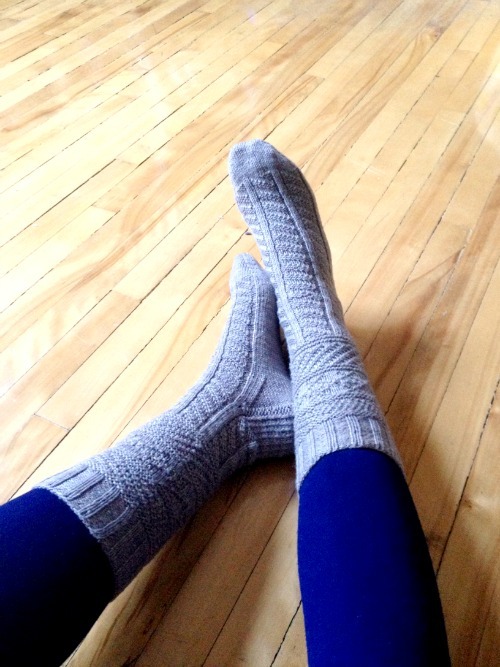 This post is, once again, all about socks! They are my most favourite thing to knit and I love wearing. In the original sock post, I mentioned that I wanted to knit a whole bunch of socks based on some of the Harry Potter inspired sock patterns freely available on Ravelry. Well, I've now completed two pairs! These are my most recently completed pair - they're called the Moody Stockings and the pattern was designed by Erica Lueder. These are my favourite socks to date - I am in love! 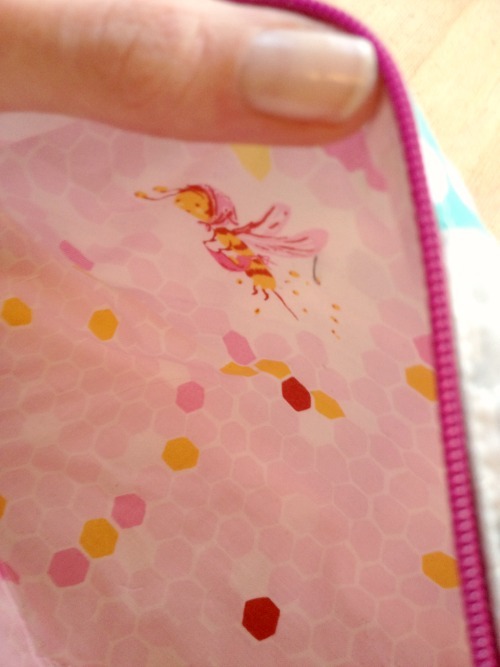 The pattern is gansey-inspired and, as the designer notes in the pattern, they require "constant vigilance!" (that's an HP-reference just in case you've never read the books). I used Shibui Knits Sock in Sand which I bought at Eat, Sleep, Knit and 2.25mm needles. I just bought these sock blockers and frankly, I really dislike them. They are far too thin and flimsy. I have my eye on a wooden pair that I really like but the shipping to Canada is crazy. I knit these socks for Alex as a Hanukkah gift, and boy, let me tell you, they took much longer to complete than socks for my feet since they're much bigger! These are based on the Phineas pattern by Rosemary Waits. 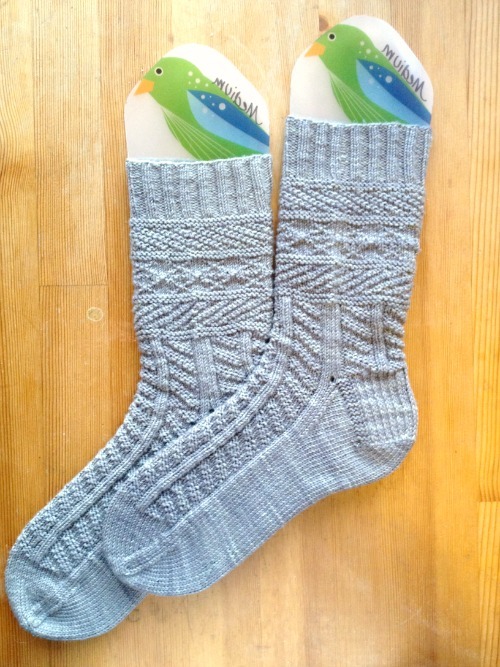 While the pattern includes the charts for making the socks "man-sized", it did not include any information for turning the heel at this size. Luckily the number of stitches matched the number of stitches in a pattern from Wendy Johnson's Toe-Up Socks for Every Body and I was able to use her instructions. This picture shows the colour and variegation of the yarn much better. For these I used Raventwist Starri in Night Rider and the same 2.25mm needles. I case you've never read Harry Potter (or you're a little rusty), the Moody Stockings are named after Alastor "Mad-Eye" Moody, retired Auror and member of the Order of the Phoenix. The Phineas socks are named after Phineas Nigellus Black, great-great-grandfather of Sirius Black and former Headmaster of Hogwarts School of Witchcraft and Wizardry (the least popular head of the school ever). 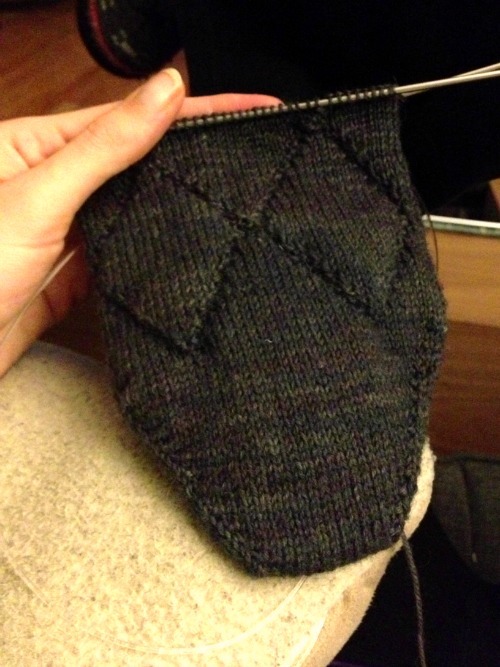 I am so going to knit more Harry Potter inspired socks - they are just so fun!! "I? 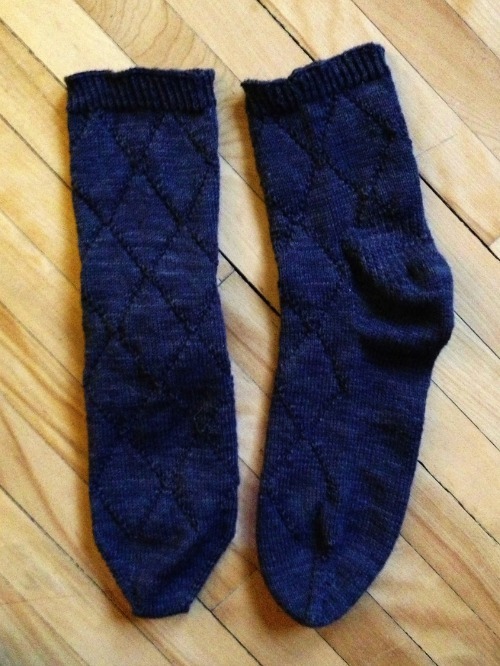 I see myself holding a pair of thick, woolen socks." Harry stared. "One can never have enough socks," said Dumbledore. "Another Christmas has come and gone and I didn't get a single pair. Magazine Feature + a Giveaway! Hey y'all! How ya doing? Look at me, blogging after only two days - I think I'm doing pretty good at jumping back on the bandwagon! 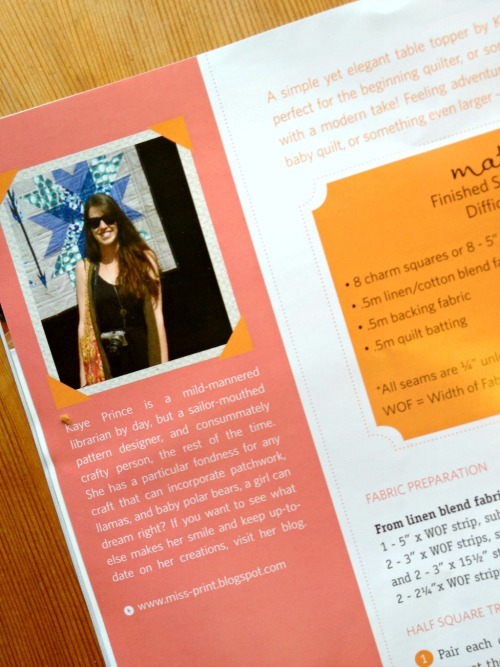 Back in the fall, I was approached by Quilter's Connection magazine about contributing to their Spring 2014 issue all about 'modern quilting'. I've previously worked with the magazine before when I was interviewed in my capacity as President of the Toronto Modern Quilt Guild (have I mentioned yet that I resigned as President at the end of 2013?) and was tickled to be asked again. 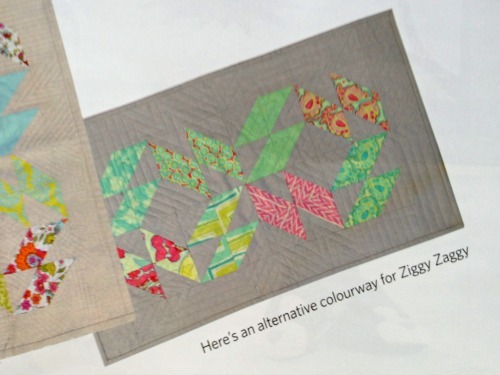 While I wasn't able to contribute a brand new design to the magazine because of time constraints and prior commitments, I gave the magazine permission to republish my Ziggy Zaggy Table Topper pattern which originally appeared on the blog way back in 2011. 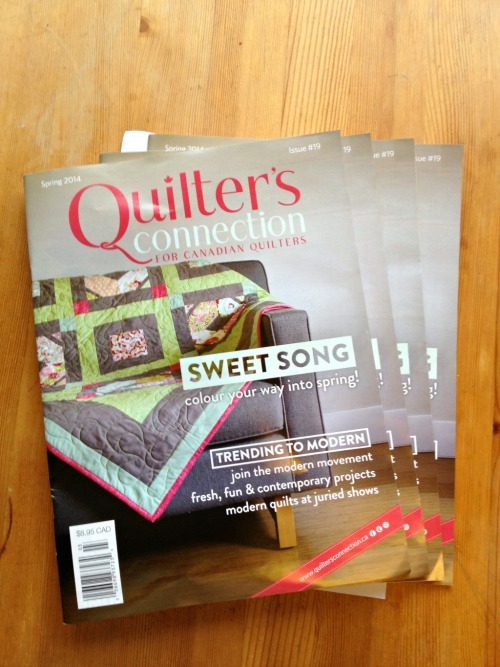 In case you haven't heard of Quilter's Connection, it is a Canadian magazine, published out of British Columbia by the lovely Heather. I'm not sure if it is available in the US, but I know it can be found in stores across Canada and is also available as both a physical and digital subscription. 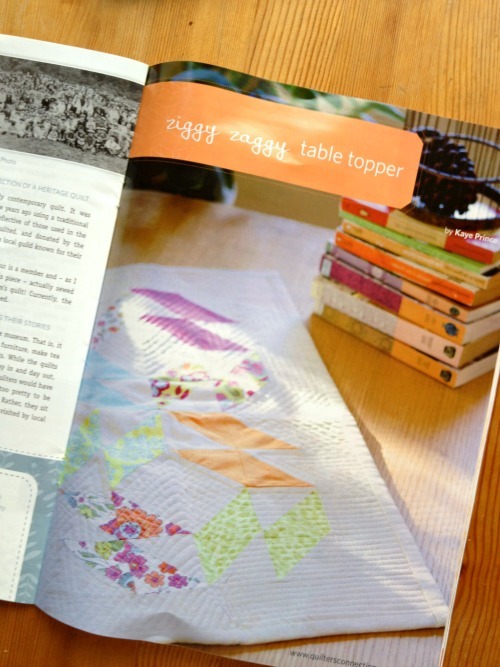 The table topper shown in the main pattern picture is the one I made back in 2011, but then QC had another one made to show another colour option. I always like it when magazines do this because it helps the reader to see how a design could fit with their own personal aesthetic. Hey look, it's me! Since I'm usually the one taking the pictures, this was one of the only ones I had to send to Heather for my little bio. I probably should do a head shot at some point in time. This issue also features designs from Cheryl Arkison (who is rad) and a slew of other great Canadian quilters. I feel like I'm in good company. about your particular country of residence. That's it! Two easy-peasy ways to enter! 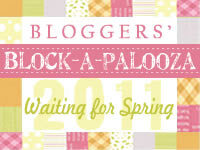 I will close the comments in a week (on March 28th) and announce the winner here on the blog. International entries are, as always, welcome! Also, please remember that I have comment moderation enabled so if you don't see your comment right away it just means that I haven't had the chance to approve it yet (duplicate comments will be deleted). Hey y'all! So, it's been awhile. The past few months have been a little rough for me, but I'm jumping back in with both feet! 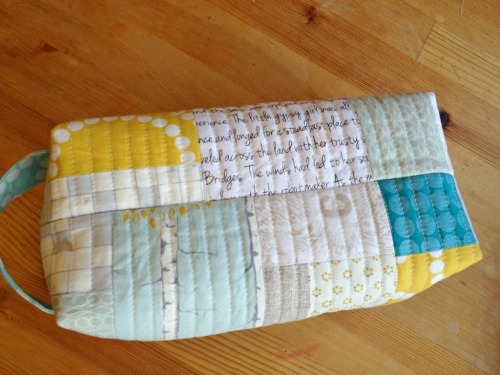 I've felt for the last little while that the quilting world is moving on without me and like I had lost my footing. Some things have happened (or not happened) that have made me feel a bit invisible and I have struggled with what exactly my place is now. I have thought long and hard over the past few months, had many chats with quilty friends (including with the master of dissection and perspective, Thomas Knauer, while I visited his family in Cambridge), and have come to the conclusion that, while my place in the quilting world has shifted, there still is a place for me. I need to always be grateful for the opportunities that come my way, take rejection less to heart, and be prepared to aim high even if it means that I might fall and fail sometimes (if not most of the time). 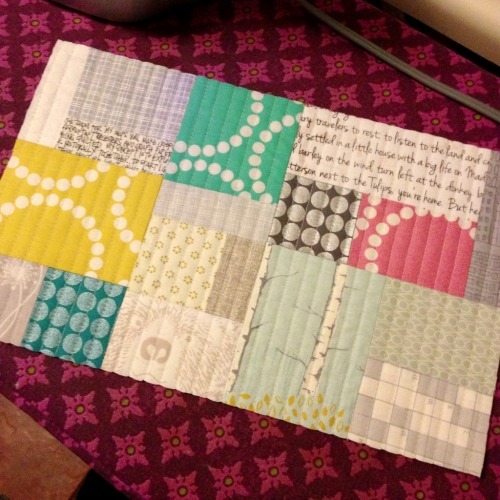 To that end, I will be attending Quilt Market once again this spring in Pittsburgh. I'll be rooming with the ever-awesome Jeni, and I am going to try extraordinarily hard to not let my anxieties and insecurities get in the way. Wow, I just got all kinds of introspective there for a minute. As you may have noticed, I now have my own domain (check it out, woot! ); as far as I know right now, this should in no way affect how you view this blog or see it in a reader (such as Bloglovin). If that is not the case (i.e. if your link from the old blog no longer works or if new posts are not showing in your reader), please let me know and I will do my best to figure out where I went wrong. I'm also working on a whole new design for the site and I'm hoping to have that up and running soon. 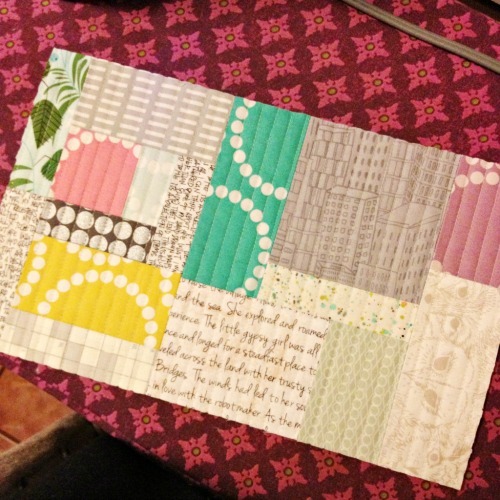 I feel like I need a fresh new look as I move forward with my quilting/sewing and my pattern business. So that this post is not completely devoid of pictures (and to prove that while I may not have been blogging, I have managed to fit in some sewing time), let's talk about the Boxy Pouch I made using Bonnie's tutorial. I made this last month just before heading to LA for two weeks for work (see, that's the other thing, work. It does have a tendency to get in the way). These cute boxy pouches kept popping up all over Instagram and I just had to make one to carry my extra knitting project to LA with me. My idea was to use lots of low volume/neutral prints and then throw in a few brighter colours for a little pop. As you can see, most of the colour pops are Lizzy House Pearl Bracelets. For the interior I used some of my most favourite print from Heather Ross' Briar Rose. That little mama bee just makes me so happy every time I see her! 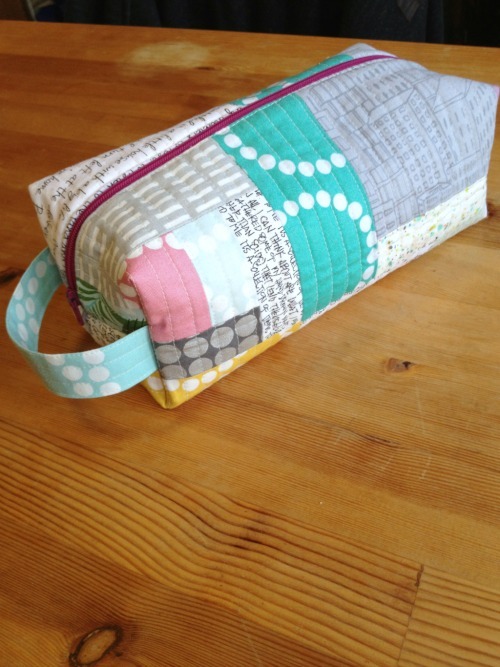 Just in case you wanted to get a better look, here are the quilted panels I made for the pouch. I have a tendency to take lots of Instagram pictures to document process (generally late at night) so please forgive the not-so-great colour action going on here. If I had thought about it a little more, I would have made sure that the aqua-green prints from both panels weren't at the top, but oh well. Okay, I think that's it for today, but you can expect to see me around these parts very soon! If you have any ideas, or something you'd specifically like to see when I redesign the site, please let me know and I'll take it into consideration. Much love peeps!